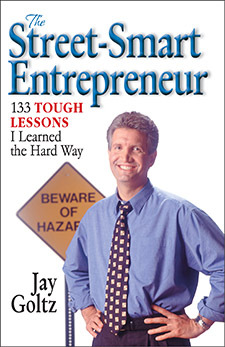 Starting with only two thousand dollars and a gritty determination to succeed, author Jay Goltz built his business the hard way…from the ground up. He made mistakes, but he also made a lot of right decisions. Today, Goltz operates a ten million dollar business—the largest custom framing facility in the world. In The Street-Smart Entrepreneur, Goltz shares two decades of hard-learned lessons on management, finance, and marketing. No waxing philosophical here. Goltz tells it like it is, and delivers a “hands-on” approach to winning in business. Savvy marketing analysis: Starting up without throwing up. Growing your business: Controlled growth or growth out of control? Hiring smart: You’re only as good as your worst employee. Knowing the numbers: Good accounting won’t make your business, but poor accounting can ruin it. Leveraging assets: All your assets not just the financial ones. Serving customers: Is the customer always right?